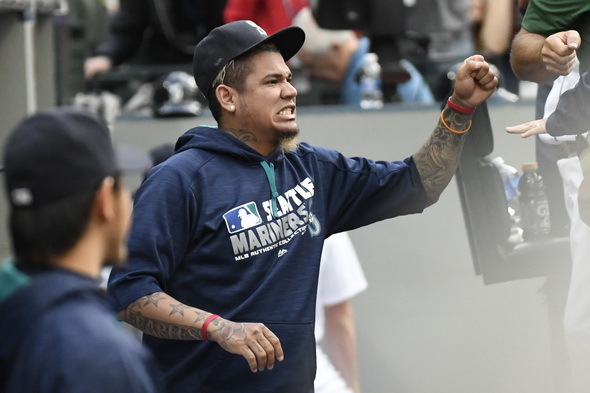 The calf strain that put Mariners ace Felix Hernandez on the disabled list June 1`will keep him there for at least another month to allow for a full healing. The King will not soon be back at the castle. ESPN.com reported before the Mariners-Rangers game Saturday that the strained right calf of Felix Hernandez is not healing quickly, and he will have to rest another month. He’s been on the disabled list since June 1. A second MRI Friday of the injury showed some improvement, but the doctor ordered further rest to prevent re-injury, Hernandez said. Hernandez, 4-4 with a 2.86 ERA in 10 starts, has missed two starts and Saturday was his third. He’s been replaced om the roster by James Paxton. Hernandez said he expects to begin throwing after the team’s 11-game road trip. Hernandez said manager Scott Servais tried to lighten the mood. Hernandez is on the disabled list for only the the third time in his 12-year career, and the first since 2008. I don’t recall him being pulled fropm a game with an injury. Given that, how did he suddenly get injured. Or was it his poor resent performance that benched him?